You know how football games now have cameras suspended directly above the field of play so you can get an aerial view of the action? That’s what you’re getting today in cat coverage. On the left, Inkblot is staring upward at the camera suspended high in the sky above him. 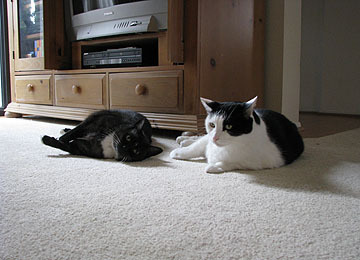 On the right, the camera descends to field level for a rare shot of Inkblot and Domino together. As you can guess, this display of brotherly love lasted about five seconds. 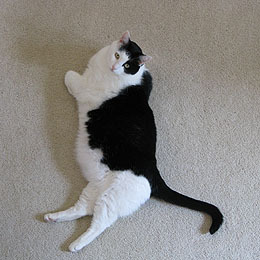 Still thirsting for more catblogging? Sign up for our weekly newsletters! The Friday newsletter is based around this blog and contains both an extra bonus post and a guest cat photo sent in by one of our readers. Today’s newsletter has already gone out, but it’s not too late to sign up for next week’s issue. Just click here.